Edinburgh University was delighted to host the Edinburgh Plant Science Summer Event featuring Dr Dave Hughes, our special guest speaker from Syngenta. News on EPS funding successes, on-going funding applications and projects was provided by Professor Karen Halliday, EPS Director (SBS, UoE), Professor Mat Williams (GeoSciences, UoE) and Dr David Kenyon (SASA). Our Internationalisation agenda was presented by Professor Geoff Simm, Director of the Global Academy of Agriculture and Food Security (UoE), Dr Alexanra Schlenzig, (SASA) and Dr Peter Doerner (SBS, UoE). Industry and Innovation talks were delivered by Dr Dave Hughes, Head of Global Technology, Syngenta, Professor Joyce Tait FRSE, Director, Innogen Insitute, Professor Gary Loake (SBS, UoE) and Dr Alistair McCormick (SBS, UoE). 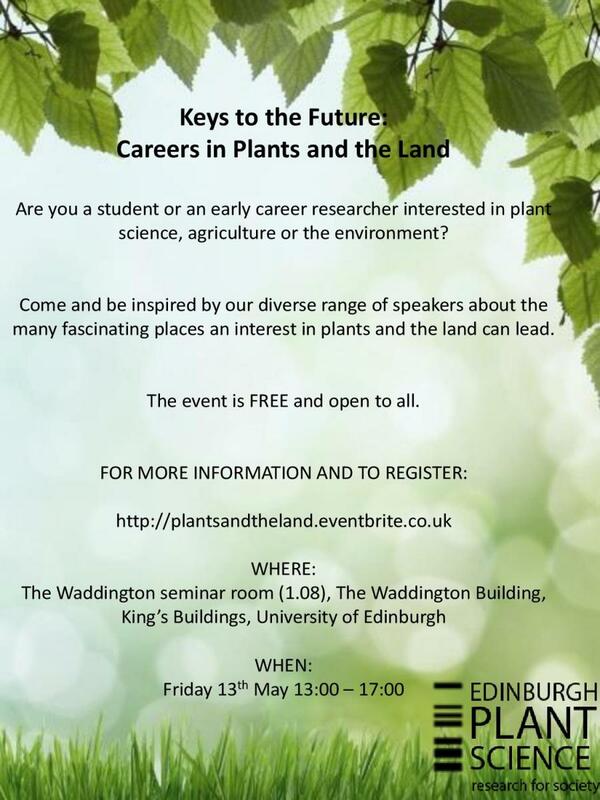 Edinburgh Plant Science and the University of Edinburgh Plant Science Society are hosting a student-organised event primarily targeted at undergraduate and postgraduate students and those early in their careers. We are showcasing some of the varied and fascinating places an interest in plants can lead to.